It can be tough owning your own business. There never seems to be enough hours in the day. You’ll have worked hard and put a lot of time, and possibly money, in to get yourself up and running. The colour on your business cards has probably changed numerous times, but now they look perfect. You’ve been to every networking event you could find and can now reel off your elevator pitch in your sleep. And your website. That could have been a bit of an investment, but it looks great! That’s that then, isn’t it? Well, no, not really. Your website has the potential to be one of your business’s most valuable assets. But if it’s been left to languish without any ongoing attention from you, you could be missing out. People have a very short attention span online, and a distinct lack of patience. If your website is failing to deliver, you could be losing potential customers. Arguably the most important reason of all. Making sure all the technical stuff is up to date helps to keep your website and its visitors safe. Hackers search the internet for websites with vulnerabilities that they can take advantage of. Make sure that’s not you by staying on top of security updates and bug fixes. Everyone knows that first impressions count. You only get one shot to tell outsiders who you are. Having a lovely, well maintained website reflects positively on your business. You look professional. You look like you care. An up-to-date website is going to attract new customers and keep them coming back. Performance: There is nothing worse than going on a website that doesn’t work properly or runs really slowly. 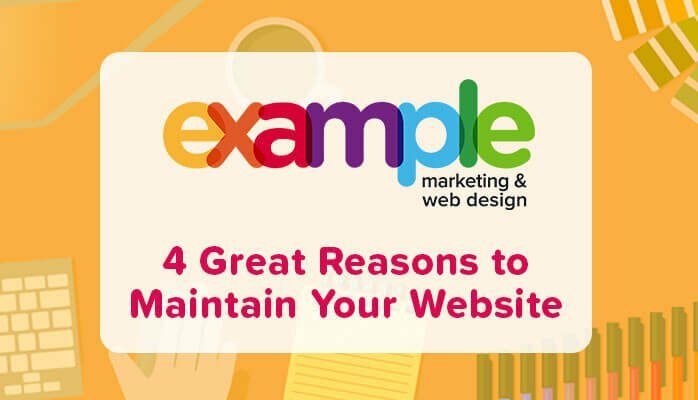 Maintaining your website will help keep its performance in tip-top condition. Don’t forget to back up your site before updating! Usability: Make sure you don’t have any broken links or links that redirect visitors to unrelated pages. The last thing you want to do is frustrate the user because they probably won’t return. Does your contact form still work? Send a quick test to yourself to find out. Things do break on a website for seemingly no reason. Frustrating, but true. Appearance:Does the way your website looks reflect your business? Are any offers still relevant? Is your blog or news section up to date? Are your contact details still all correct and easy to find? Regular content updates give visitors a reason to come back. If you just can’t find the time or don’t have the know-how to keep your website in ship shape, we may just be able to help. Get in touch today and ask for a free website review. At Example Marketing we’ve built our business to help you grow yours.